Hello Sunshine! As part of my Home Depot Patio Style Challenge I repainted our covered concrete porch. This was something I’d always wanted to do cause over the years it had chipped and faded and it was ugly. 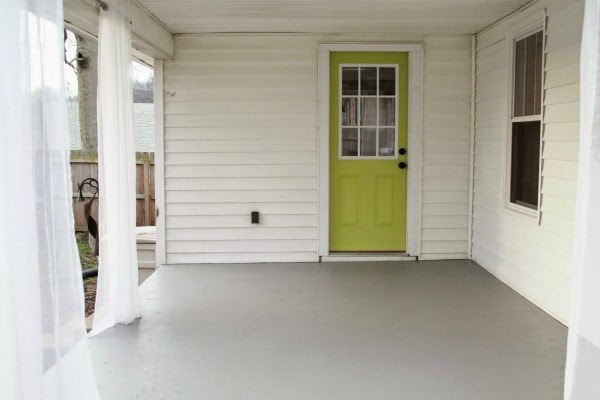 Not wanting to simply paint over the worn chipped paint, I researched how to properly repaint a concrete porch. These are the simple steps to have you well on your way to a professional looking paint job. First you want to clear off your work area by removing all items that aren't stationary. Sweep up all debris. 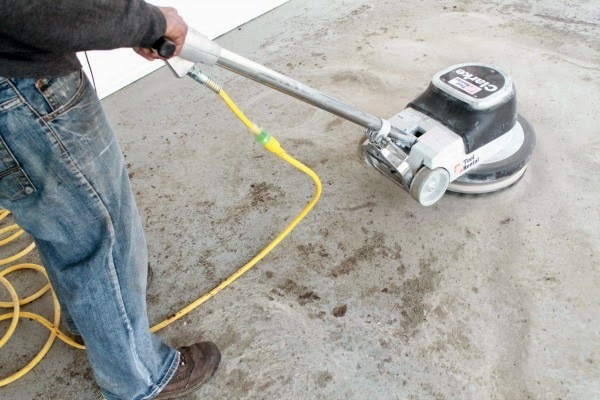 Using a pressure washer, clean your concrete. If you have oil spills or tough stains I recommend using a degreaser like Behr's No.990. 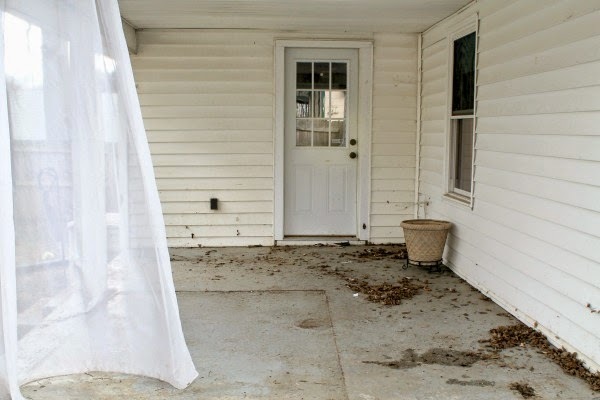 Now that your porch is all clean it's time to remove that old tattered paint. There are several different methods to achieve this, however we used a floor maintainer fitted with a concrete prep tool to scuff and remove the paint. Gently guide the floor maintainer over your porch floor. When you are satisfied that all the paint has been removed, pressure wash to remove all the dust an debris. Some might say to allow the floor to dry for at least 4 hours before etching. Not sure is this is necessary. By happenstance I had to wait a month before continuing due to weather. **Tip: Wear a mask, there will be a lot of dust. To keep dust to a minimal dampen the surface. You can rent these tools from Home Depot Tool Rental Department. It takes a few tries to get a hang of the machine, be careful. To etch the surface of the concrete, dilute 24 ounces of muriatic acid per gallon of water in a plastic bucket, watering can, or pump sprayer. Gently stir with a non-metallic spoon. In a separate bucket mix eight parts water with one part ammonia. The porch should still be damp from the previous step, if not, dampen with a hose. 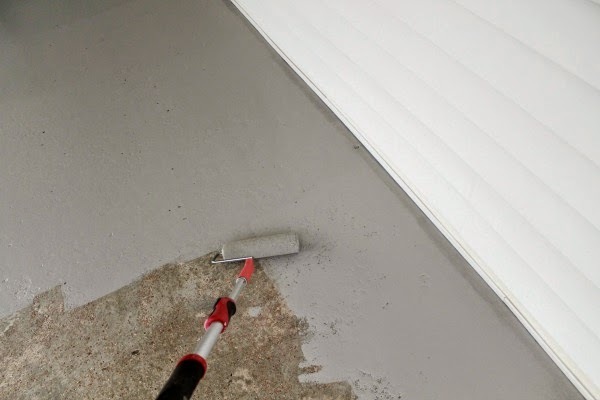 Pour the acid solution evenly over the concrete and spread to any missed areas with a long-handled brush. Once the acid stops fizzing about 5-10 minutes, flood the porch with the ammonia solution to stop the chemical process of the acid. 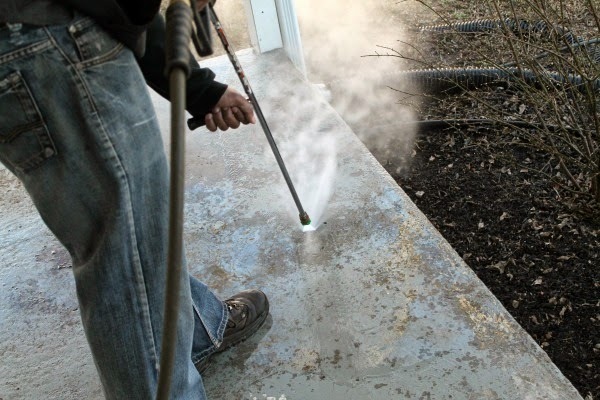 Immediately pressure wash the porch to remove any traces of acid and ammonia. Allow to dry for at least 4 hours. **Tip: Wear protective gloves, rubber boots, and safety glasses when working with chemicals. Priming helps paint bond to the surface you're painting and using Behr Bonding Primer will help prevent peeling of the topcoat. Now after all this work you don't want peeling. You will apply this primer like you would any other paint. Starting with the edges using a brush, then continue over the surface with a 3/8" nap roller. This doesn't have the usual consistency of paint, it is really thin, like watery milk. You only need one coat of bonding primer. It goes on white then dries clear in about 4 hours. After waiting the recommended 4 hours of dry time, you can apply your first coat of Behr Porch and Patio Paint. I went with the color Fresh Cement. I added a non-skid floor additive to the paint. One pouch per gallon of paint. It provided a subtle texture finish and now I don't have to worry about slips and falls. I started with the edges using an angled brush to cut in. I moved slowly applying a thin layer, the paint is thicker due to the additive. I continued over the surface with a 3/8" nap roller working myself away from the house and off the porch. I applied two thin layers of paint. Allow to dry 4 hours between coats. Wait 72 hours to fully cure before you walk and move your outdoor furniture and planters on your newly repainted porch. Then enjoy! 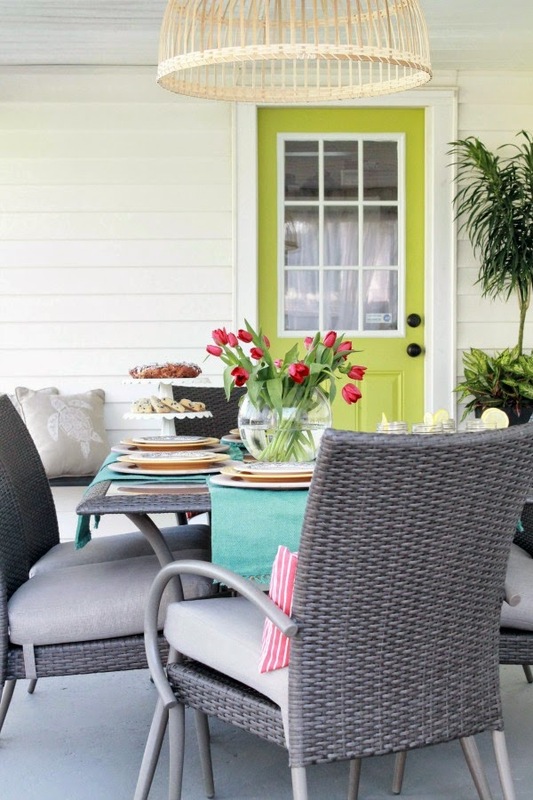 If you are planning on repainting your porch in the near future, I hope this post helps you on your way. Remember this is what worked for us and our porch needs. See ya soon! New paint made such a big, beautiful difference! Hi Carrie! It has held up well. Aside from a few scratches, made from dragging a saw across the patio, there has been no chips. I'm really happy with the paint. The lite gray I chose is hard to clean with all the mud the kids track up on the porch but with a bit of elbow grease it comes up. I think other darker colors you wouldn't have that problem. Thanks for stopping by Carrie!